Plymouth University has been awarded a two-year multi-agency grant of £340,000 by the Engineering and Physical Sciences Research Council (EPSRC). The grant will fund an international project working with Bangor University (Wales), University of Auckland (New Zealand) and Deltares research Institute (Holland) exploring wave processes across rocky platforms. The WASP project aims to capture a unique dataset of detailed wave measurements across a range of rocky platforms around the UK coastline. 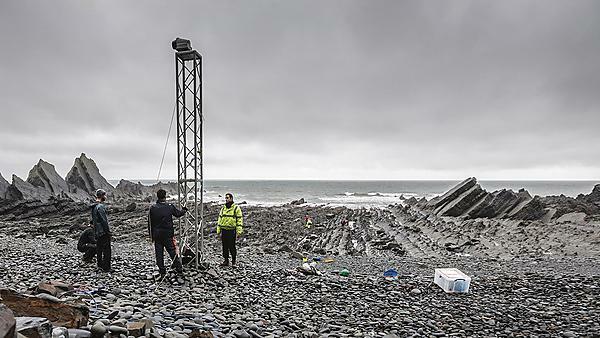 Using the latest wave sensors, digital video and laser scanners the project will map the decay in wave energy across intertidal rocky platforms. These measurements will be used to improve existing models which aim to provide a predictive tool for examining wave energy reaching our coastline which can cause erosion and cliff falls. For more information or to contact the team please email Dr Tim Poate. The Coastal Processes Research Group in the School of Marine Science and Engineering at Plymouth University has established a strong international reputation for research in coastal hydro- and sediment dynamics, and, in particular, in conducting field-based research, complemented by numerical modelling. An impressive and well-maintained coastal research instrumentation suite is available to the project, which includes for this project a variety of state-of-the-art hydrodynamic sensors and beach survey equipment totalling £200k, supported by expert technicians with over 15 years experience in designing and deploying such instrumentation. Building on the success of the recent NUPSIG project the research group has invested in more state of the art wave sensors and a terrestrial laser scanner providing highly accurate and rapid data collection. The ability to deploy instrument quickly and safely makes the team highly mobile and responsive whilst working in some of the most challenging and unforgiving environments. Coastal research over the past few decades has focused on hydrodynamics, sediment transport and morphodynamic processes in depositional coastal environments (beaches, shoreface and estuaries). However, a large proportion of the world’s coastlines, perhaps as high as 80 per cent, are rocky and characterised by cliff and/or intertidal shore platform topography. In large tidal environments, such as the UK, these platforms tend to be gently-sloping seaward (<5˚), wide to very wide (100–500 m) and characterised by rough and dissipative surfaces. Cliffs and shore platforms are linked dynamically because shore platform characteristics (elevation, gradient, width and surface roughness) directly control the transformation processes of waves propagating across the platform, and thus the impact on the cliff. In large tidal environments, such as in the UK and Wales, shore platforms are wide (> 100 m), have gentle gradients (<5 ˚) extending into the subtidal zone and represent very rough surfaces. As a result, considerable wave energy losses occur as waves propagate across shore platforms. In combination with the water level, this wave transformation determines how much open-ocean wave energy is allowed to reach the base of the cliff, but this process is virtually unstudied within coastal engineering. These wave transformation processes must be understood quantitatively to be able to predict coastal processes along rocky shores; therefore, the subject of the proposed research is to understand how waves propagate across shore platforms and develop a capability to reliably model this process. Our intention is to conduct comprehensive and detailed field measurements of wave transformation across six different shore platforms and under a range of wave/tide conditions, and derive universally valid principles from our observations that better describe and enable the prediction of wave transformation processes across rocky shore platforms.